My third, and final (at least for now), Central London hideout is also one of my favourites. I first ventured over to Charlotte Street about 6 years ago when I first lived in London and my mum had come help me move. We had read from our guidebook that Charlotte Street was one of London’s great restaurant streets and so we thought we could definitely find somewhere nice to have dinner if we headed that way. It was my first “encounter” with the street, and I still remember feeling excited about ALL the dining possibilities that seemed endless (yes, food is my life). After our lovely visit I kind of forgot the existence of the whole place, and only remembered it again around the time when I started seeing my boyfriend as he worked in the area. I have so many fond memories of meeting him for lunch when I still worked shifts and how we would always try to choose a new place to try. Although we did end up in Nando’s quite a few times… Shh! I pride myself in being pretty familiar with a lot of restaurants on Charlotte Street & the nearby area and yet I have probably not even tried a third of them – that’s how many there are! That guide book from six years ago definitely wasn’t lying when it said that Charlotte Street was one of London’s greatest restaurant streets – whatever your tastes, you can probably find somewhere lovely to go if you head this way. There are little independent restaurants as well as chain restaurants, multiple different eateries offering various world cuisines and always something suitable for every budget. Out of all the central London hideouts I’ve talked about so far, I’ve definitely saved the best for last. One thing I would say though is that Charlotte Street is not really the place to head to if you want to go shopping – although that’s probably also the reason why it’s the quietest of them all too! Oxford Street is only about 5 minutes away, so if you’re desperate for some retail therapy the answer is not too far away at all! 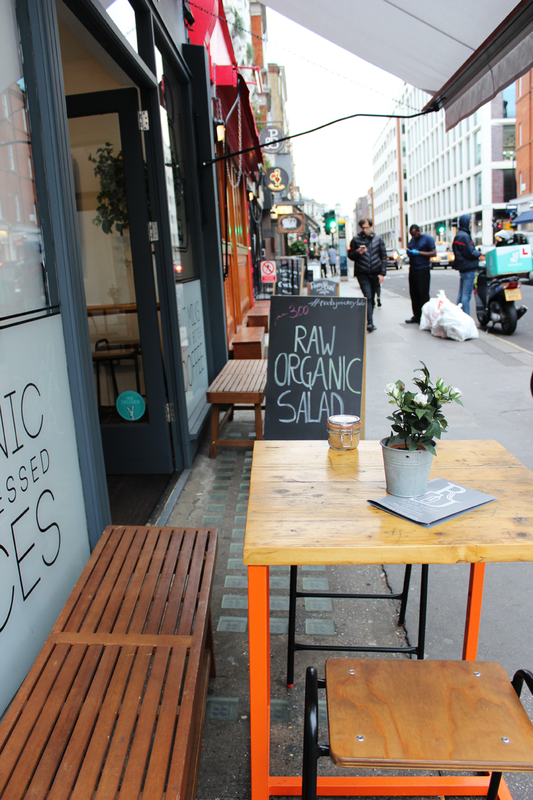 If you’re after healthy eats you could head over to Roots Juicery on Goodge Street (just off Charlotte Street) serving cold pressed juices, smoothies and healthy food such as yummy salads and breakfasts. According to their website, Roots are very environmentally conscious too, serving all of their drinks in glass bottles, and offering you 20p back if you return them to the shop. What a lovely idea – more places could learn a thing or too from this! There’s also a super informative guide to all the ingredients and their benefits on the website – go have a peek if you’re interested! Other healthy(ish) places in this are are the gluten free Bakery Beyond Bread on Charlotte Place, the healthy cafe chain Pure on Goodge Street and the fancy Japanese restaurant ROKA on Charlotte Street itself (the Japanese are healthy, right?!). Charlotte Street has an incredibly varied selection of international cuisines from French and Italian all the way to Vietnamese and Korean restaurants. One of my new favourites is somewhere I just visited last week, a Bengali restaurant called Calcutta Street, situated on Tottenham Street, just off of Charlotte Street. It has an amazing friendly atmosphere, making you almost feel like you’re having dinner at your friends house instead of a restaurant. The service was really warm and attentive and the food & drinks (the cocktails!) were amazing too. Other restaurants with food from around the world I would recommend are the Thai restaurant Siam Central, the Korean BiBimBap specialising on, you guessed it, bibimbap, the country’s national dish, and the absolutely lovely and atmospheric Spanish tapas restaurant Barrica on Goodge Street. There are still so many restaurants on Charlotte Streets and its neighbouring area I want to try, which is why I head over there pretty much weekly for either a drink, a little snack or a full blown meal. The street also hosts quite a few chain restaurants such as my favourites Wahaca and Zizzi and I always enjoy visiting them here more than anywhere else due to the lovely buzz and atmosphere of the whole area. And then there are the pubs! So many lovely pubs. The whole area (Fitzrovia) was actually named after one specific pub, The Fitzroy Tavern, on 16 Charlotte Street. It’s a famous historical pub dating back years and years, and which in the 1920s and a few decades onwards was a meeting place for many of the era’s artists and writers such as Dylan Thomas and George Orwell. Other pubs I love in the area are Draft House and Bricklayer’s Arms amongst with maaaany others! A word of warning though: don’t try to go into these pubs on Friday night expecting a seat – they are often packed full of after work drinkers, especially on Fridays, due to the many offices that are located across the area. Saturday’s are a lot quieter, but if you’re not afraid of crowds (and it’s a nice weather), standing outside and taking in that beginning of the weekend atmosphere isn’t too bad either! Have you been to Charlotte Street yet? What’s your place to eat and drink in Fitzrovia?